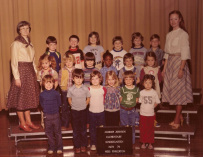 When I began teaching kindergarten in 1974 in Tennessee, things were a bit different. I wore dresses, skirts, or pants with heels. Yes, sitting on the carpet for circle time could be challenging. I made home visits at the beginning of the school year to get to know my students and their families. I was a single teacher and therefore all of my time and energy went into my classroom and my students. I spent long weekends and nights making games for learning centers and bulletin boards and displays for my room. I shared an assistant, which at that time we called an aide, with two or three other kindergarten teachers. She typed my newsletters on a "fancy" typewriter and ran it off on a mimeograph machine. I kept small lists or reminders on the palm of my hand, before post-it notes. It was a different time in education when teachers joined our professional organization because that was a part of becoming a professional educator. I began grad school classes during my first year of teaching where I read all the research about methods in teaching kindergarten and a major emphasis was on parent involvement. This inspired me to form relationships and partnerships with all of my parents. From this sprang a very successful parent volunteer program which provided extra hands during center time every day of the week and many drivers and chaperones for field trips. These parents were from all walks of life and learned a lot about parenting through working in my classroom. Yet, let it be known, that I learned even more about parenting from each of them. At the end of each school year I invited all of the families to my home for a cookout. The first few years of my career, it was a small apartment with a patio and community yard. A bit later it was my home with a big backyard. I got to know these parents so well that many of them remain some of my closest friends today after all these years. My very first year I had 25 kindergarteners, which included a couple of sassy little girls; queen bees. I believed in praise and smiles for these little ones and my famous lines began with, "Would you please....." I learned the hard way that you had to establish your authoritative voice early on to set the standard at the beginning of the year. Needless to say, the following year I found my authoritative voice and a way to smile sweetly as firmly corrected my five-year-olds. Education practices in the early 70's focused on behavior modification with rewards. I set up a play money bank and gave students a dollar each time they exhibited good behavior, which could be cashed in for a prize from the treasure chest. It didn't take me long to learn that classroom management was mandatory for survival in the world of little people. Of course good classroom management is one of many aspects of education that remains key today. However, it was a different time for corporal punishment, when I had permission to paddle students for misbehaving; which happened but was rare. Then again, in kindergarten a little pop on the rear often got their attention. My second year of teaching, I had one little boy named John who was quite the rounder. Keeping up with him was a challenge and he was like a small running everywhere. John seemed to get more pops than anyone in the class. One day after a scolding or "redirection", he got mad and walked out of the classroom. Before I knew it, he was on his way home where his mom rushed to retrieve him and bring him back to school. (She was a very supportive mom who volunteered and knew what her son was capable of doing.) At the end of the school year he (his mom) gave me a t-shirt that said "I'm the Boss!" While he didn't believe it at the time, I'm sure he is probably a very successful "boss" now. Yes, much has changed since I began teaching, but there are a few things that remain constant; those being the students' joy for learning and my love for teaching. I continue to seek ways to improve my skills in the classroom. I'm still standing. I'm always excited about beginning a new school year. After 30+ years of teaching I never tire of the challenges that are put before me. Summer gives me an opportunity unwind,relax, and rejuvenate as I reflect on the accomplishments of the previous year. August comes around and I'm ready to get another school year started. When I meet my students for the first time and see their enthusiasm and joy for school I'm inspired to begin a brand new adventure in teaching and learning. As teachers we come together in inservice meetings to prepare for our students. Words of inspiration are often shared. Here's a message I'd like to share with you. I am a teacher! What I do and say is being absorbed by young minds who will echo these images across the ages. My lessons will be immortal, affecting people yet unborn, people I will never see or know. The future of the world is in my classroom today and this future has potential for both good or bad. The pliable minds of tomorrow's leaders will be molded either artistically or grotesquely by what I do. Several future presidents are learning from me today; so are the great writers of the next decades and so are all the so-called ordinary people who will make the decisions in a democracy. I must never forget these same young people could be thieves and murderers of the future. Just a teacher? Thank God I have a calling to the greatest profession of all! I must be vigilant everyday lest I lose one fragile opportunity to improve tomorrow. I teach 4th grade at Powell GT Magnet Elementary School in Raleigh, North Carolina.